The recent NFL combine has pulled the collective fantasy football attention to the primary source of new production, the next rookie class. But sometimes the most impactful sleepers are veteran players the world believes they’ve categorized correctly but actually haven’t. Every offseason, I like to compare the efficiency of important running backs to their prior season’s usage to see if any show the potential to expand their roles or threaten to lose carries or targets because of ineffective play as a rusher or receiver. 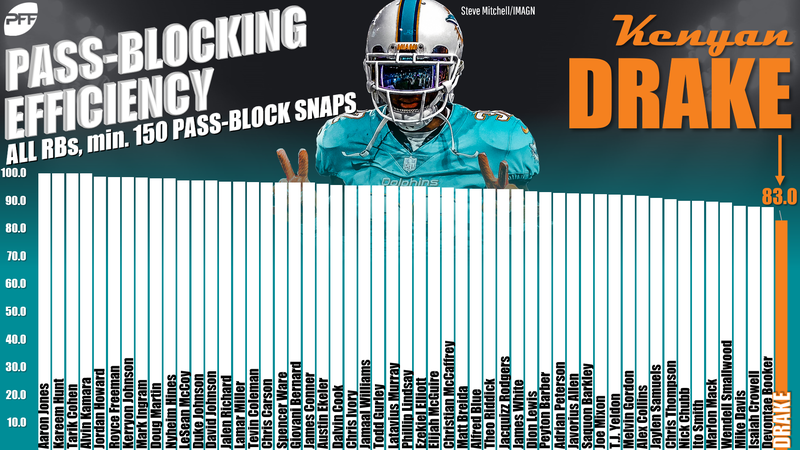 The following chart shows every back who carried the ball at least 50 times last season. It is sorted from highest to lowest on target percentage, which is the ratio of targets to total opportunities (targets + carries). Receiving backs tend to be high on the chart, have low Rushing Yards Added totals, and have high Receiving Yards Added totals. Early-down backs tend to be low on the chart, have high Rushing Yards Added totals, and have low Receiving Yards Added totals. When there is a mismatch between a back’s target percentage and his Yards Added breakdown, then that is a clue that he may not have the right role for his skill set. 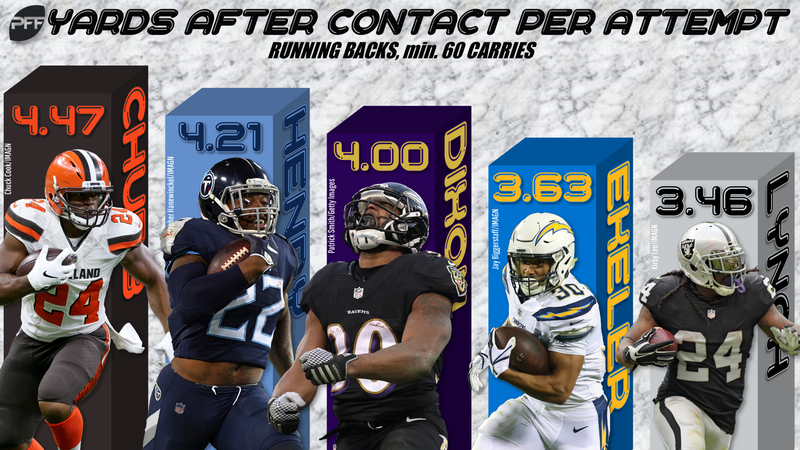 NFL teams played excellent matchmakers for their running backs and roles in 2018, especially for their receiving backs. The top-10 qualified backs in target ratio added 108 yards as receivers and cost their teams 132 yards as rushers. The only target-heavy back I think may have been miscast is Drake, and that dissonance was more the result of fleeting overall efficiency than of mistaken strengths and weaknesses. In 2017, Drake led all backs with 106 RuYards Added thanks to a position-leading 4.3 yards after contact per attempt. Last year, that rate fell to a middling 2.7 yards. Drake has never been a positive contributor as a receiver in a season, but his hyper-efficiency as a runner in 2017 spurred the Dolphins to keep him on the field every down late that season — similar to what the Packers eventually did with Aaron Jones last year. If Drake is a neutral-efficiency runner like he showed in 2018, then there is no incentive to play him on third downs when his ineffectiveness as a receiver and as a pass-blocker — he was worst at the position with an 83.0 pass-blocking efficiency in 2018 — are most likely to hurt the team. The Dolphins may not play him at all and instead look for his and Frank Gore’s replacement in the draft or free agency or in 2018 fourth-rounder Kalen Ballage. Lewis earned his guaranteed $8.25 million with a career 4.8 yards-per-carry average that was inflated by low-difficulty carries. He actually cost his teams 15 yards compared to what a typical back would gain with the same set of carries prior to 2018. With a more typical between-the-tackles role with the Titans last year, Lewis saw his YPC fall to 3.3 yards to mirror his poor RuYards Added total. Now, there is little excuse for the Titans to evenly split their carries between Lewis and Derrick Henry, who has paced the position with 222 RuYards Added over the last two seasons. It may make more sense for the team to convert Lewis to the Duke Johnson to Henry’s Nick Chubb. Burkhead repeated as a minus contributor as a rusher and positive contributor as a receiver in his second season with the Patriots in 2018, but his target ratio fell from 36% to 25. I suspect the team didn’t feel like it had better options to carry the ball. Jeremy Hill tore his ACL in Week 1, and Sony Michel struggled in his rookie season, costing the team 52 yards across his 209 carries. If Michel can improve as a sophomore or if the Patriots can add another rushing threat, I suspect Burkhead will see his workload shift back toward the passing game in 2019. Samuels was the last Steelers back standing for much of December, and he acquitted himself nicely in a featured role, adding 6 yards as a receiver and only costing the team 4 as a runner. I wouldn’t normally trust those trends over samples of just 56 carries and 29 targets, but they perfectly match the expectations for a player who caught passes on 52.7% of his college touches. James Conner was exceptional in his breakout season, adding 13 yards as a runner and 18 as a receiver despite an exhausting workload, but I could still see Samuels catching some passes alongside Conner the feature back in 2019. In deeper PPR formats, Samuels could have more value than the typical Steelers handcuff. Ware excelled as an every-down back for the Chiefs in 2016, adding 20 yards as a rusher and 53 as a receiver. But then he tore his PCL, and the Chiefs drafted Kareem Hunt. Ware had to wait nearly two years for his next regular-season start, and after it finally came in Week 13 last season, hamstring and shoulder injuries ended his year just one week later. Ware is an afterthought coming out of a Chiefs season bookended by Hunt’s and Damien Williams’ strong play, but his totals of 12 and 15 Rushing and Receiving Yards Added in limited opportunities suggest that he has returned to form. He could be a cost-saving three-down free agent option for the team that doesn’t want to pay Le’Veon Bell or even Tevin Coleman money. It’s a great time to try to add Ware in your dynasty formats. No one would mistake Anderson the receiver for the player he so admirably replaced as a runner, Todd Gurley, late in the 2018 season. Anderson was pretty much a neutral receiver last season, as he has been over the course of his four-year career. However, Anderson was one of the positional leaders in pass-blocking efficiency when he was a workhorse for the Broncos in 2017. Hindsight suggests that Christian McCaffrey was the reason Anderson barely played for Carolina, not Anderson himself. On the right team in 2019, he could parlay his excellent efficiency as a runner and pass-blocker into a three-down role. Dixon’s semi-breakout 2018 season is eerily similar to teammate Alex Collins’ the year before. Both were highly efficient runners thanks to excellent yards-after-contact numbers that they somewhat counterbalanced with excessive fumbles. But I don’t think it’s fair to discount Dixon’s chances to carve out a healthy workload in the future just because his predecessor couldn’t back up his breakout season. Dixon was a well-regarded prospect before injuries sabotaged the first few years of his career, and his 9.8% reception ratio at Louisiana Tech was similar to current three-down backs like Devonta Freeman and Aaron Jones. At 5-10 and 200 pounds, Ekeler is close to the same size as former Charger Danny Woodhead. And stuck behind three-down back Melvin Gordon, Ekeler has developed a similar change-of-pace reputation. It probably won’t help that he carried the ball 106 times last season, the exact total that Woodhead reached in his peak-volume season. But despite their many similarities, Woodhead and Ekeler look like different kinds of players in their efficiency numbers. Woodhead peaked as a neutral runner and routinely cost his teams 20 or more yards on limited carry volumes in individual seasons. In contrast, Ekeler has added 53 yards on just 153 career carries to go along with his 52 Receiving Yards Added on barely half as many targets. He finished top-five at the position with 3.6 yards after contact per attempt in 2018, just ahead of noted tackle-breaker Marshawn Lynch and his rookie doppelganger Rashaad Penny. Based only on his efficiency, Ekeler has the potential to be a premiere every-down back. I think the critical question is whether he will ever find the chance to prove it. Yards Added has always valued Gordon more than his prior-to-2018 subpar yards-per-carry rates suggest one should. I don’t think the Chargers would be imprudent to re-sign Gordon next offseason, especially if they remain competitive and have concerns about Ekeler’s and the undersized Justin Jackson’s abilities to hold up to 200-plus touches. Ekeler’s potential makes him impossible to ignore, but he likely has the shortest odds to find a future workhorse role of the four backs under this heading.